Roger’s Community Garden provides a space for campus to grow organic produce and educate students about sustainability initiatives. Photos by Erika Johnson. 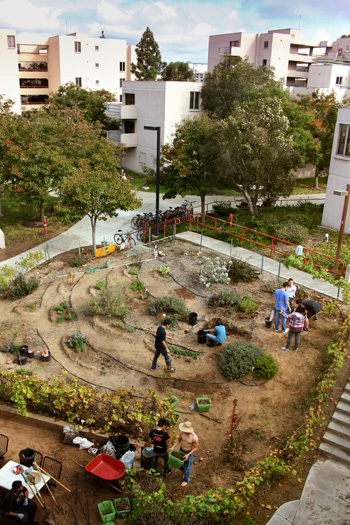 Whether tucked away among the eucalyptus groves, or secretly ensconced within student housing, UC San Diego is now home to numerous gardens across campus that promote the education and growth of sustainable food and local produce. These small vibrant patches provide space for students to cultivate organic vegetables, fruits, herbs and other plants that support healthy, natural diets—an initiative that echoes campus programs that provide eco-friendly vegan and vegetarian options for students, faculty and staff at all dining locations. Behind the Ché Café on the southwest side of the campus, a mulched pathway leads to a quarter-acre garden, newly renamed Roger’s Community Garden in honor of Roger Revelle, one of the founders of the university. The space has a long history spanning 30 years, but it is only recently that an organized and environmentally conscious team of students began maintaining the area. Students and campus organizations join together to maintain the quarter-acre space at Roger’s Community Garden with irrigation systems, composts, and mulch distribution. According to Hauenstein, more than two dozen members of Roger’s Community Garden lease plots to grow plants for pleasure, produce food or conduct research. 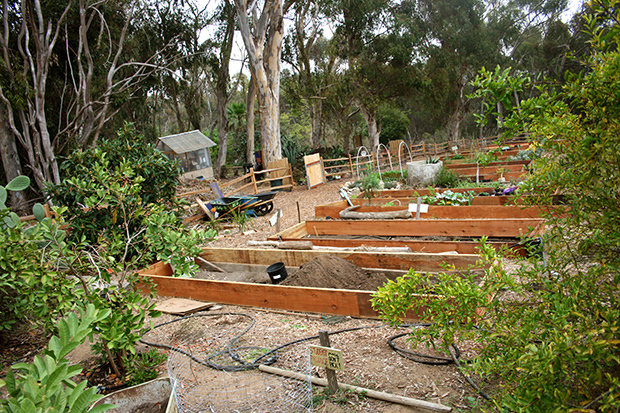 Similar communities have formed across campus, including the Pepper Canyon Urban Farm at Sixth College, Ellie’s Garden at Eleanor Roosevelt College and, most recently, Earl’s Garden at Warren College. 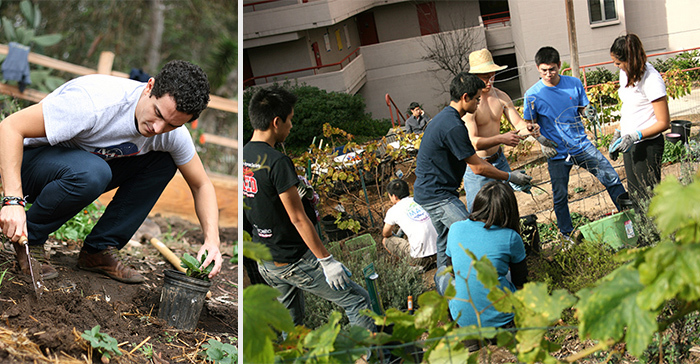 Many student organizations also contribute to the development of the garden. Engineers for a Sustainable World (ESW) recently collaborated to construct a compost pit, a vermicompost (worm composting system) and a sink with a water collection system. The project was funded both by ESW and a Green Initiative Fund grant from the Student Sustainability Center. Earl’s Garden, located within student housing at Warren College, provides a space for students to learn about and grow sustainable food. Due to their increasing popularity, more environmental classes and majors are being offered on campus, and the gardens serve as a great place for students in these classes to gain practical knowledge. In the summer, Stephanie Jed, UC San Diego professor of literature, offers a seminar on the politics of food. Her students study plant selection, conduct research on how community gardens are governed and financially sustained, plant their own seedlings and go through the process of identifying campus markets for the produce they grow. Housing, Dining, and Hospitality (HDH) has also partnered with regional farms to help supply local, organic produce to meet the University of California requirement that 20 percent of food provided on campuses stem from sustainable sources by 2020, according to Krista Mays, sustainability manager. In order to support reliance on local producers, HDH has set up a Farm to Table program—most directly associated with catering and special events—to supply fresh fruits, vegetables and herbs. Many of the farms are located in Southern California and span the county from Growers Connection in Chula Vista, to apple farms in Julian and Cunningham Farms in Fallbrook. HDH also has teamed up with staff nutritionists to determine how best to cater to the campus’ dietary preferences and requirements. Many dining locations and markets across campus offer organic, vegan, fair trade and gluten-free menu items. HDH recently opened a restaurant dedicated solely to vegan dishes, aptly named Roots. According to Mays, “Housing, Dining and Hospitality continued to see an increased demand for vegan meal options. We decided it would be beneficial to provide a location that offers strictly vegan-style meals to meet the needs of our students.” The new restaurant, which opened in January 2012, has experienced a great reception from students.